An agreement was signed by Iran and Venezuela to set up a joint venture for the production of tractors in Venezuela using Iranian technology and know-how. The joint venture was set up with 51% of the share capital belonging to Iran, and the assembly line was soon after installed and the manufacturing plant of the joint venture was inaugurated in Ciudad Bolivar city, 700 km away from Caracas, by President Khatami and the Venezuelan President, Hugo Chavez Frias, on 13th March 2005. Referring to this joint venture in his inauguration speech, Khatami said that in his opinion this manufacturing plant was a small affair for a great country such as Venezuela but it could be considered as a good starting point. The Venezuelan President pointed out that the two countries were determined to expand relations. 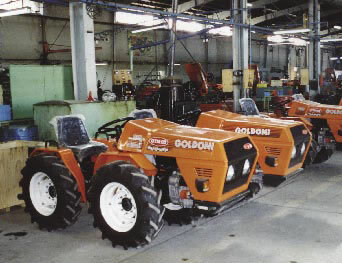 Khatami also added that this tractor manufacturing joint venture, Veniran Co, was a reflection of the two countries’ determination not to be just exporters of raw materials and importers of finished products but to produce their needs for manufactured goods themselves. The tractor producing plant cost 34 million dollars to build and has a production capacity of 5,000 tractors a year. Iran shall supply 80-100 million dollars a year worth of parts required by Venezuela for the manufacture of tractors. The company will be managed by Iranian personnel and will employ, directly and indirectly, about 200 people. According to the Deputy for Sales and Marketing of Iran Tractor Manufacturing Co, there is a new plan to set up a joint venture with Tajikistan as well and build a plant in that country to produce tractors. There is great hope that by October 2005, this plant will come into production. The assembly line will meet Tajikistan’s demands and leave a surplus for exports. The total annual production of this company shall be about 5,000 tractors a year. During the past year, Iran Tractor Manufacturing Co has made other achievements too, among them receiving the Certificate of Organizational Excellence, the Kaizen Board Award, and the Consumer Protection Award.